NOTE: This is an edited version of my original SXSW review that was published here on March 14, 2009. What do you do when you've made what many consider to be the worst film of all time? 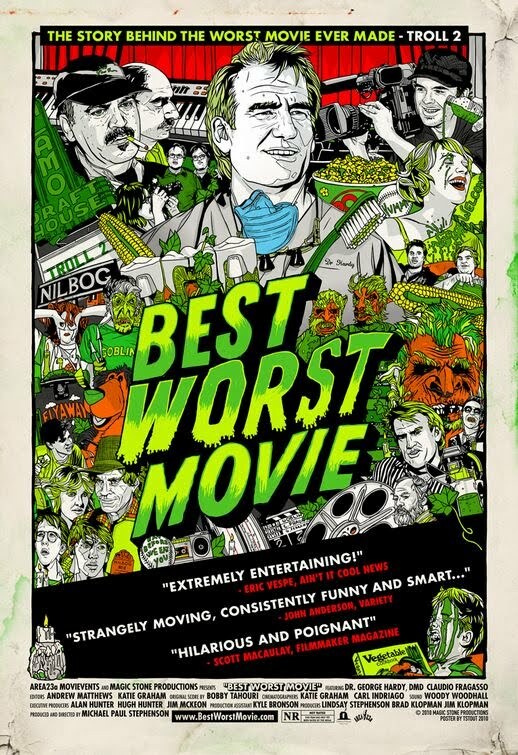 Well, at least that's what former child star Michael Paul Stephenson is doing with his new documentary, Best Worst Movie, which chronicles the making and subsequent cult phenomenon behind Troll 2, which was once listed as #1 on IMDB's bottom 100 list (it has since been unseated by Night Train to Mundo Fine). I knew nothing about Troll 2 before seeing this movie. Conventional wisdom usually names either Plan 9 From Outer Space or Manos: The Hands of Fate as the worst film of all time. 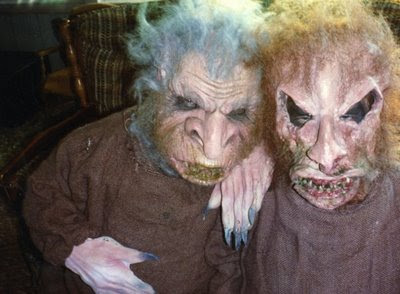 But from the looks of Troll 2, it could definitely give either one of them a run for their money. Stephenson, who starred in Troll 2 as Joshua, a little boy who discovers that a gang of hungry vegetarian goblins (yes...goblins...there are exactly zero trolls in this film) are out to turn he and his family into plants so they can eat them, treats the subject with a kind of affectionate bemusement. The film starred a cast of unknown actors, led by a local dentist named George Hardy, and was directed by Italian director Claudio Fragasso, and has absolutely nothing to do with the original Troll. So why has an ineptly made piece of direct to video, low budget horror schlock like Troll 2 had such an enduring legacy? Well that's what Stephenson aims to find out by interviewing cast members, fans, and ultimately following George Hardy around on a national screening tour with Troll 2. What follows is a something of a real life Christopher Guest movie, featuring a never-ending parade of quirky characters that are just too strange for fiction. From the self absorbed director who considers his film an important work of art, to the kooky actress (a role that would be perfect for Guest regulars Catherine O'Hara or Jane Lynch) who compares Troll 2 to Casablanca without a hint of irony, the world of Troll 2 is a phenomenon like no other. Even the fans will admit that Troll 2 is a horrible film, and look on it more as an entertainment to be mocked and enjoyed for its sheer camp goofiness and ineptitude. So its amusing listening to the director defend its artistic and cultural merits, continuing to insist that its an important film and that anyone who disagrees doesn't know what they're talking about. He seems genuinely surprised when he attends a screening in which the audience howled with laughter at things that were not meant to be funny. It's that kind of self seriousness that turns Best Worst Movie into an examination of an underground cultural niche into a full blown comedy. Stephenson directs with a sense of irony and a knowing twinkle in his eye. It's interesting to watch the evolution of the characters, even the genial dentist George Hardy seems to get caught up in his sudden stardom, only to have things put back into perspective by some disastrous horror convention appearances. The film does seem to veer into exploitation territory when it heads into the home of Margo Prey, who played the mother, Diana, in Troll 2. A recluse who takes care of her elderly mother, Prey clearly doesn't have a firm grip on reality and one wonders if she would be better off with a psychiatrist rather than being played for (some admittedly really funny) laughs in a documentary. The real triumph of Best Worst Movie however, is its ability to place Troll 2 in the proper context, by examining not just the fan base, but how it affected the lives of its stars as well. The human drama that unfolds isn't necessarily profound, but it becomes a fascinating exploration of the widespread effects this film has had on the mostly ordinary people who made it, for better or worse, and how it has become integrated into their everyday life. It is obviously a work of passion for all involved, even if it is a kind of tongue-in-cheek, bemused passion, it’s hard to deny the strange affection the filmmakers feel for Troll 2. Is Troll 2 the worst film ever made? Perhaps, perhaps not. But Stephenson has ensured that it won't soon be forgotten either way. Best Worst Movie takes cinematic trash and turns it into comedy gold. BEST WORST MOVIE; Directed by Michael Paul Stephenson; Not Rated; Now playing in Austin, TX, expands to additional cities soon.